The result of all this disagreement in the symptoms of depression/ melancholia leads to the situation, as Solomon points out, â€œ â€¦ what we call illness is also really quite arbitrary; in the case of depression, it is also in perpetual flux.â€ With all this historical overview in regard to the variability in what constitutes depression/melancholia it is important to agree upon a framework to assess how Shakespeare makes sense of the depression/ melancholia of Hamlet. The frameworks I will use are those of Freud and Klein. 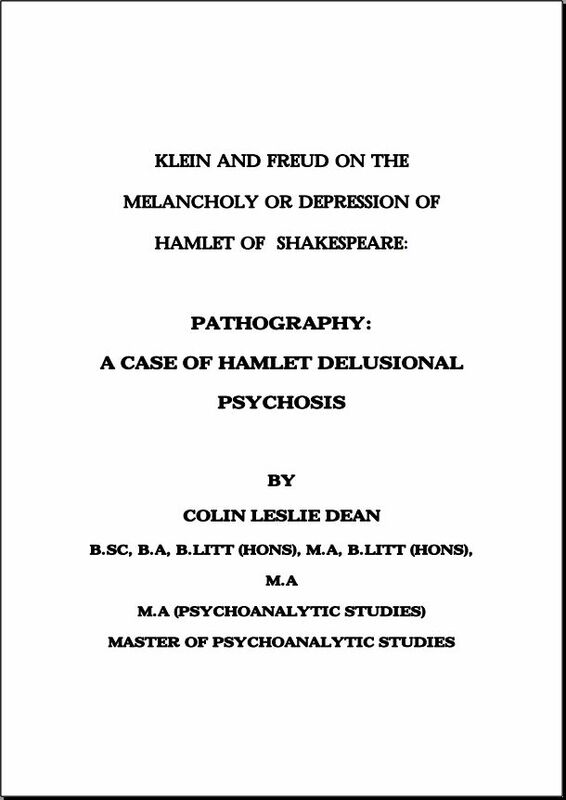 It is important to realize that both Freud and Klein offered a symptomology of depression as well as a metapsychology to explain the symptoms For Freud the loss of an object be it a thing or idea/ideal resulted in the person identifying with the lost object and regressing to an earlier stage of development where the person attached himself with self-deprecations.